Warning: review may contain spoilers. I love Christmas books; seriously, LOVE. I’ve started listening to my Christmas CDs already, and it’s not even November. When I say I’m a Christmas fan, I mean it. For that reason, I was super excited to read Candlelight Christmas by Susan Wiggs. I’ve read a few of Susan Wiggs’ books and liked them quite a bit. There are parts of this book that make all your romantic dreams come true. Some of the scenes, especially the Christmas ones, are truly magical. The descriptions make you feel like you are there, living every moment along with Darcy. Parts of this book are what I dream about when I hear the word Christmas. I particularly liked the scene where Darcy and Logan snuck out of the lodge in the middle of a snowstorm to hang twinkle lights on a tree in the middle of a field so that Santa would have a runway for landing. You can’t get much more magical than that. For all those reasons, I gave this book four out of five stars. But if the author hadn’t been quite so gifted with her ability to write real-to-life descriptions and wonderful settings, I might have given this book only three stars, because there were some real problems with character motivation. The main problem I had was with Darcy’s reasons for not wanting kids. To be honest, I just didn’t find it believable. She had a bad marriage to a man who had step-kids. The step-kids were mean, miserable kids toward the end of the marriage. Apparently, that made her decide not only to never marry a man with kids, but also to not even have kids of her own. I can understand being wary about step-kids after that, but not having her own kids? That doesn’t make sense to me. If this was just a side conflict, it wouldn’t have mattered so much, but unfortunately, it was the main source of tension between Darcy and Logan. There were also a few places in the story where both Darcy and Charlie, Logan’s son, said and did things that I felt weren’t true to character. If you love Christmas romance novels I would still recommend this one, even with the problems it had. It still had that spark of Christmas magic! 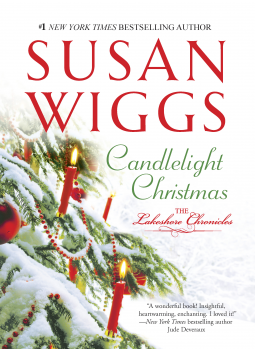 Candlelight Christmas by Susan Wiggs will be available from Harlequin Books, November of 2013.